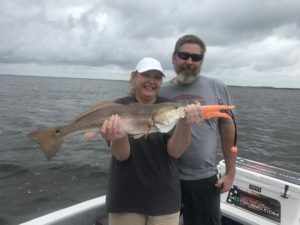 In spite of one of the windiest months I can remember, the fishing was excellent. Trout fishing on the flats had people pulling out drift socks or using their Powerpoles more than usual to fish their favorite pothole areas. 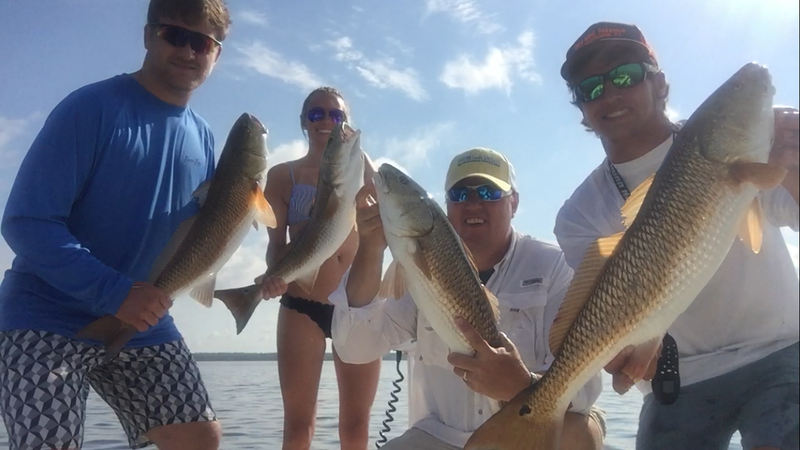 Redfish were still schooling and weren’t much affected by the wind. 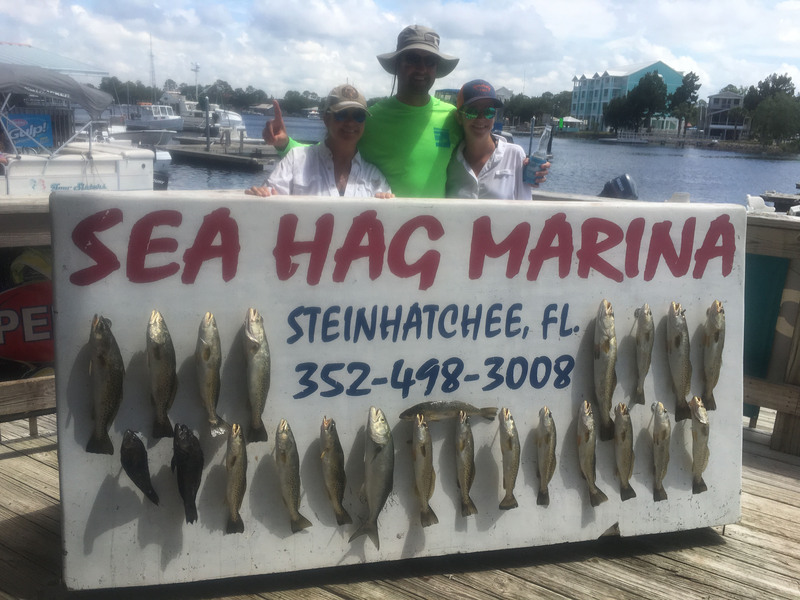 The wind made near- and offshore fishing a bit dicey at times. The Spanish and kingfish numbers seemed to be down this year as they migrated through, but there were bunches of cobia around. Weather was a challenge for the Perry Optimist Club tournament, but the Shands Fishing for Kids tournament was great success, raising money for the Children’s Miracle Network. 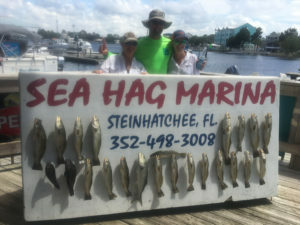 Here are some pictures of this month’s catches. The Colwells from Blairsville, Ga. found some giant trout on the flats. 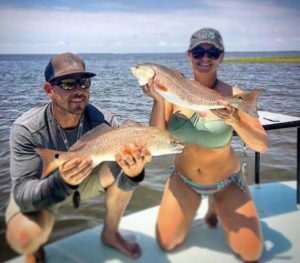 Alyssa and Matt Cowart from Gainesville with two fine redfish. 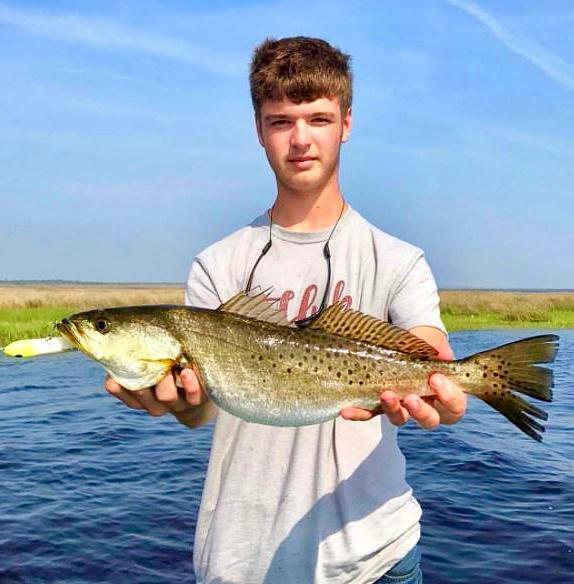 Garrett Riley from Perry with a topwater trout along the shoreline. 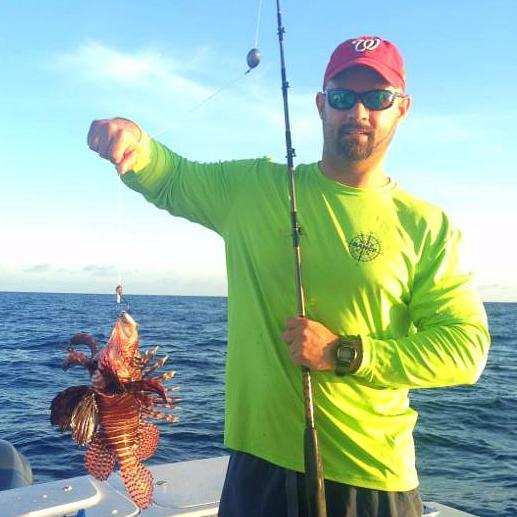 Lionfish are definitely in our area; this one found Donnie Ellington’s bait. 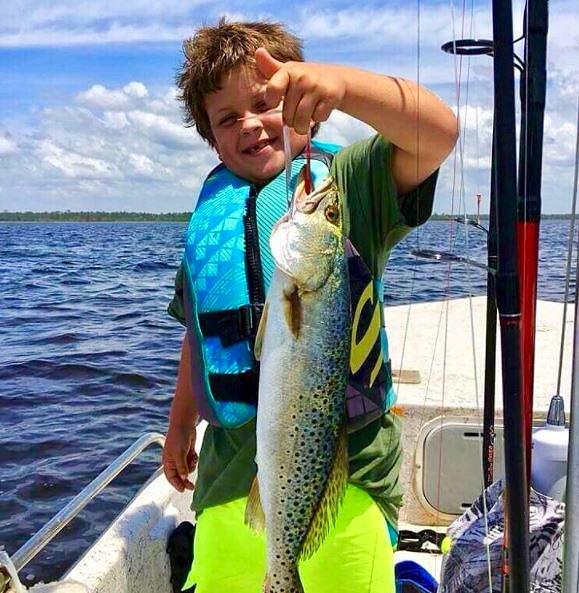 Hunter Patrick from High Springs with a fine trout. 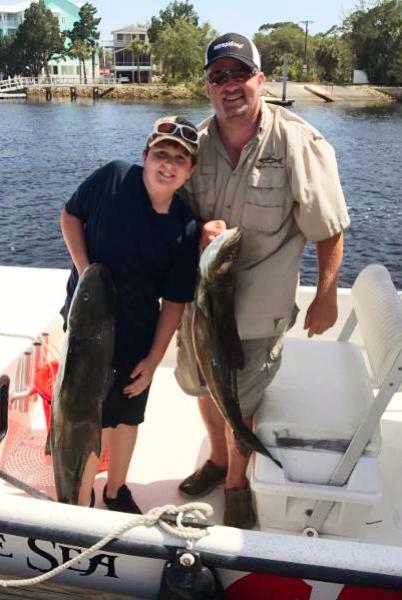 Chris and Fischer Jones from Jasper rented a Sea Hag boat and came across these two cobia. 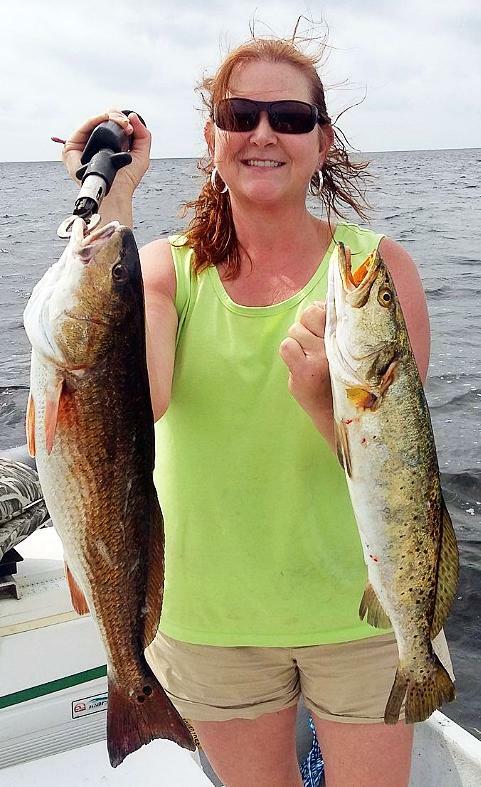 Janet Townsend from Lake City with a classic combo….redfish and trout. Kaitlyn Scelzi with a nice keeper trout. 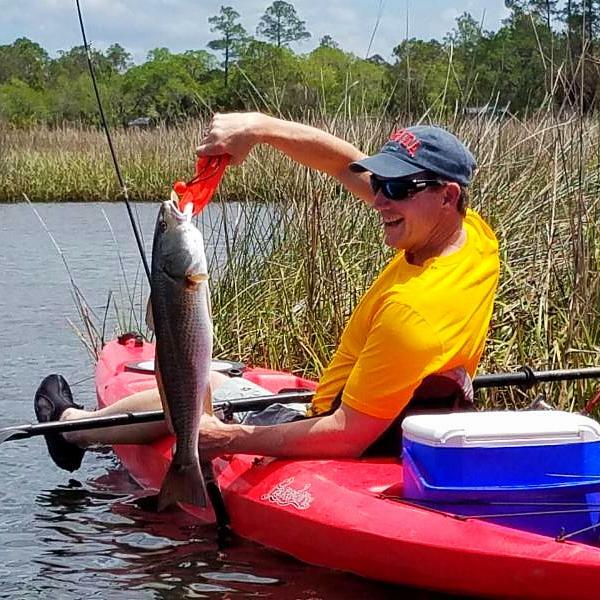 Jeff Owens kayaked out of Sink Creek to find this redfish. 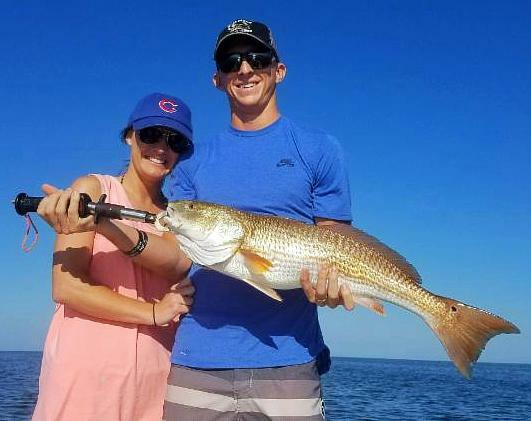 Newlyweds John and Tiffany Fox from Moultrie with a huge redfish. Jason Witherspoon from Lake Park, Ga. with a gator trout. 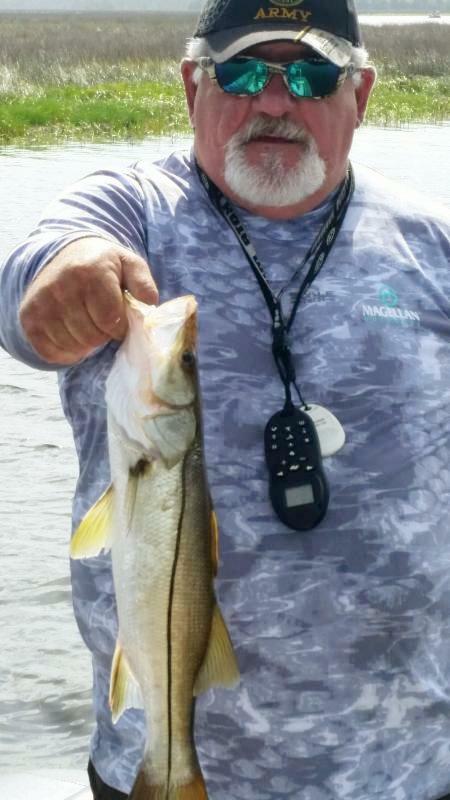 A few warm winters have brought some snook to our area; Kenny Porter from Jacksonville found this yearling. 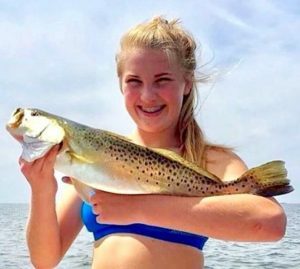 Nicole and Ashley Mock won the Shands Fishing for Kids tournament with largest trout bag and largest redfish. 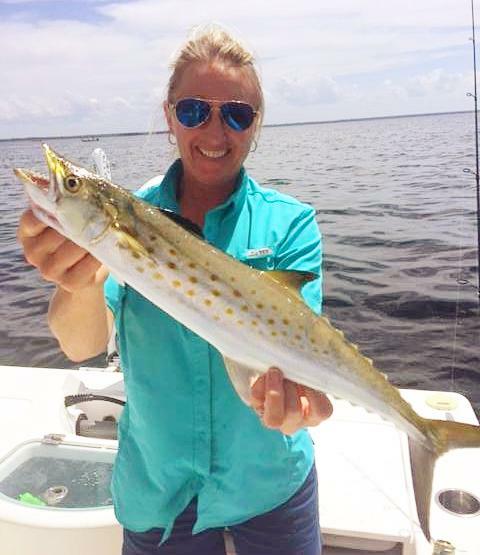 Patty Powl from Jacksonville with a nice Spanish mackerel. Michelle Young found this bull redfish. Skipper, Rusty and Scott Smith from Macon found a school of redfish. 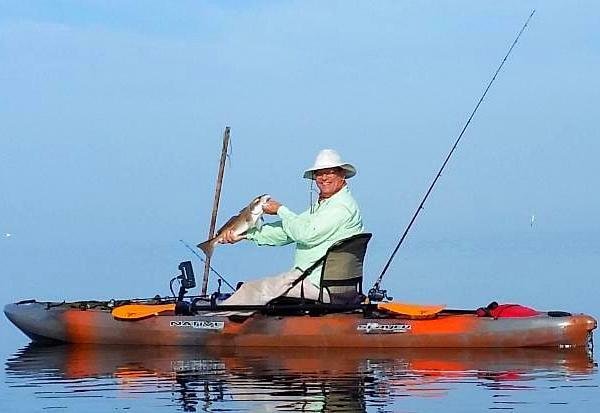 Steve Vick from Duluth, Ga. fished his kayak in Dallus Creek and came upon this redfish. 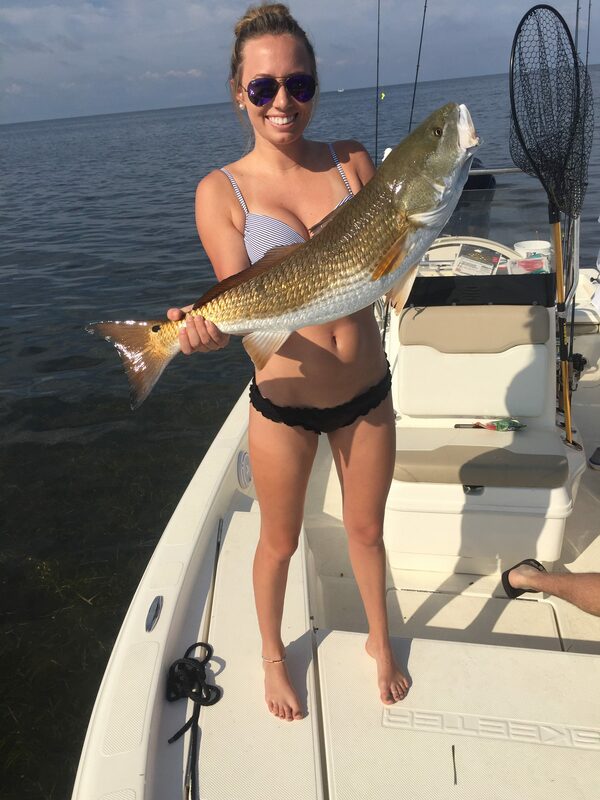 Mimi Diamond from Savannah with a nice slot-sized redfish. 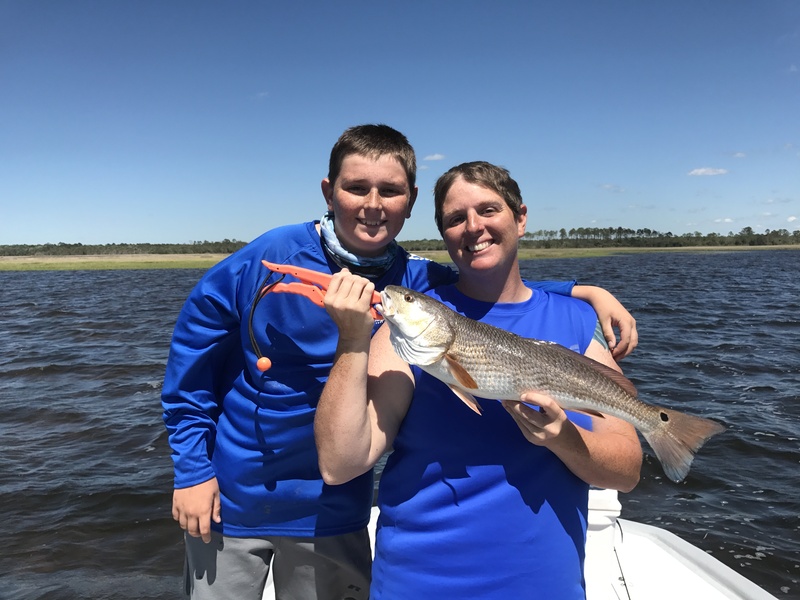 Lots of fun at the Shands Fishing for Kids Tournament. Because of higher water temperatures, fish for large trout and redfish at daybreak in shallow water near marsh lines, or on deeper mixed sand and grass flats in 4 to 10 feet of water. 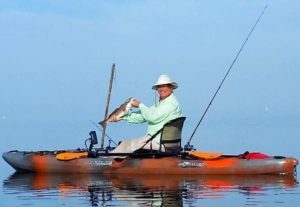 If there’s no floating grass, fish topwater plugs for some exciting fishing. 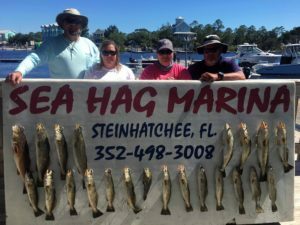 Look for schools of mullet near shore for more active areas. 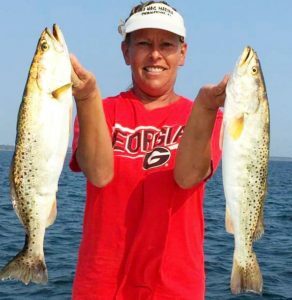 On deeper flats, fish jigs with Gulp tails or live shrimp on jig heads. 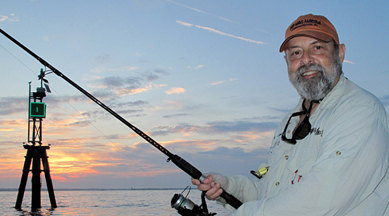 Expect to find some black sea bass as well. Look for schools of whitebait if you can find them to troll jigs or small spoons for Spanish mackerel. 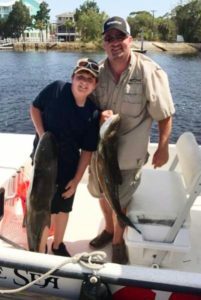 Offshore, gag grouper season is open in federal waters; our red snapper recreational season has been devastated by regulations; for details, please read Capt. Wiley Horton’s post below. 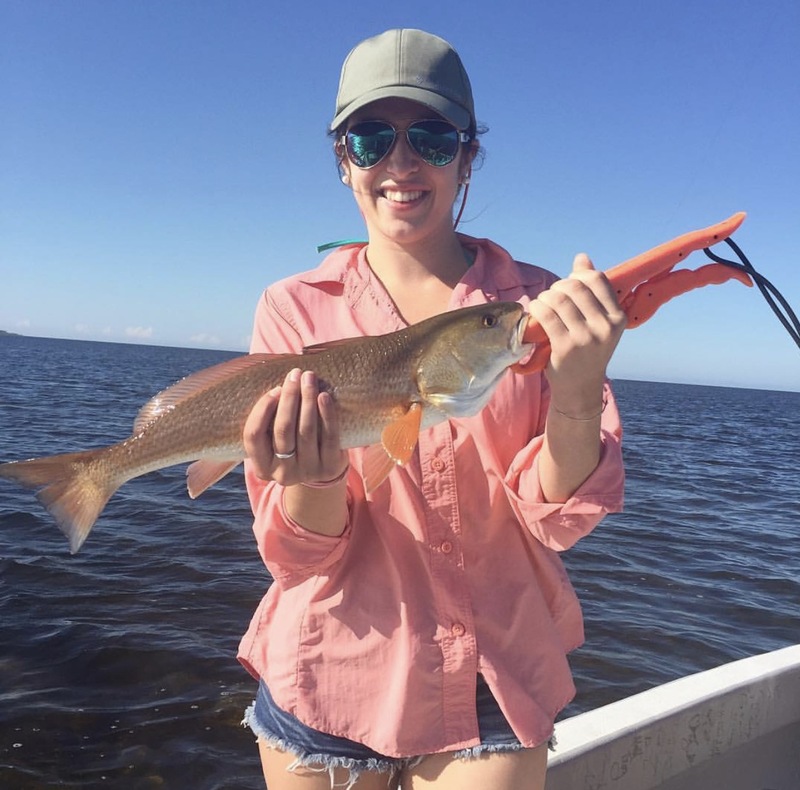 It’s disheartening, given the large number of red snapper in our area, but we will continue to hope for some commonsense regulations in the future. Additionally, amberjack season will be closed for June and July. 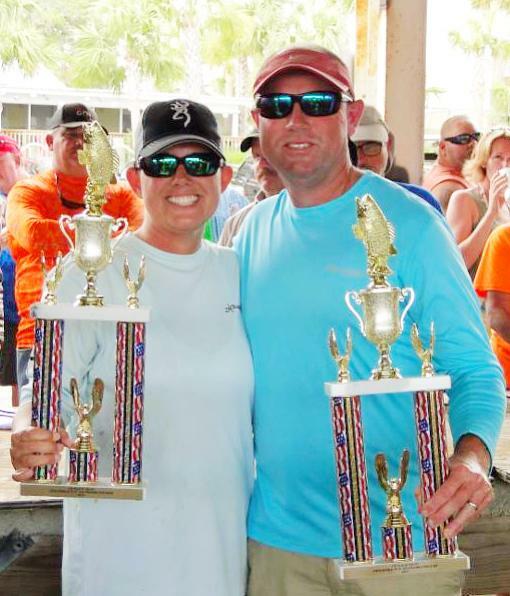 We have two exciting tournaments taking place this month. June 2-3 is the largest tournament in our area, the Doug Johnson Reeling for Kids Tournament. 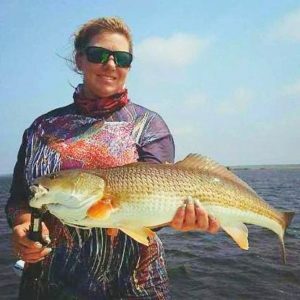 June 10th is the always entertaining Nauti-girls Tournament (no guys allowed except as boat boys). 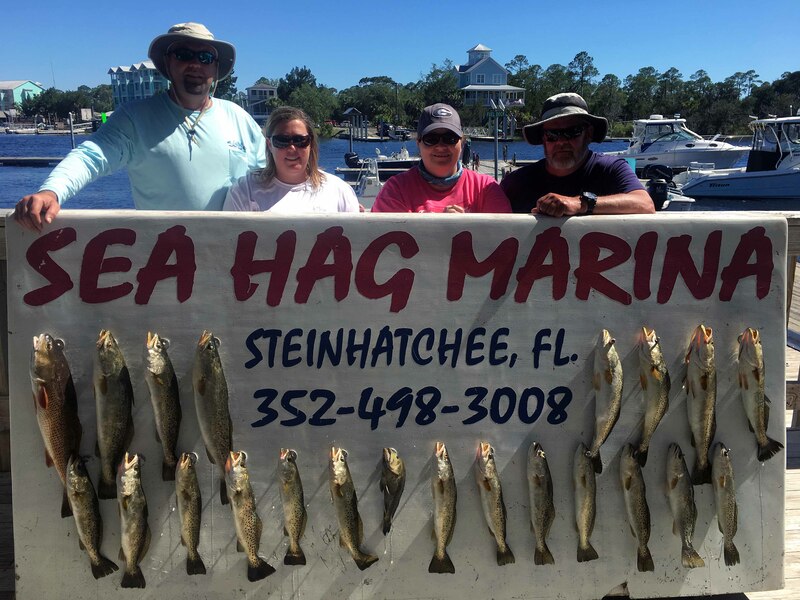 So make plans to spend a lot of time this month at the Sea Hag Marina, the best place to be during scallop season. May was a great month to fish on the flats. 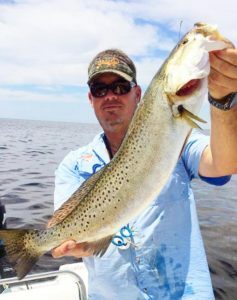 Plenty of trout to be found in the shallows and the deeper flats. 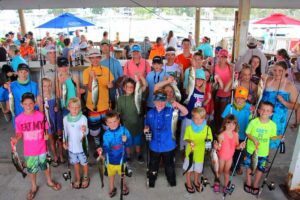 Quite a few in the over 20″ class and a few being taken over 27″. Redfish are still roaming the shallows. A few are starting to move out to the deeper flats but most are still along the shore line. 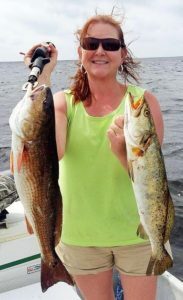 June 1st is a long awaited day for offshore fishermen; both gag grouper and red snapper seasons open that day. In a stunning refutation of every available bit of actual on-the-water experience, the Gulf of Mexico Fisheries Management Council has decided that red snapper continue to undergo overfishing. 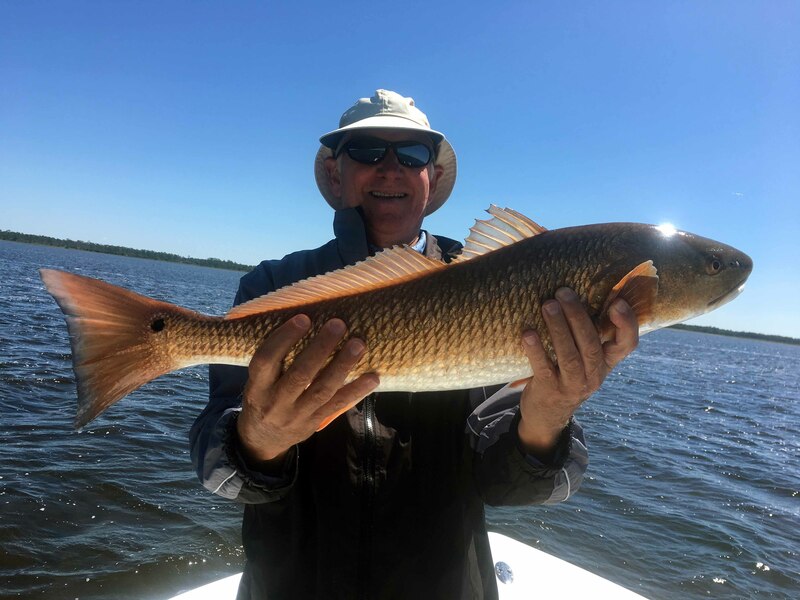 The result is a 72 hour recreational season. 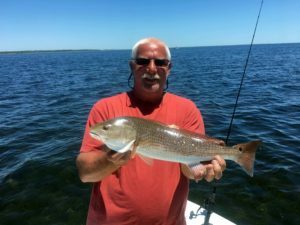 There are a few dozen commercial permit holders that were given 52% of the red snapper allocation. About 1000 charter boats get around 21% of the red snapper allocation over a 50 day plus season. 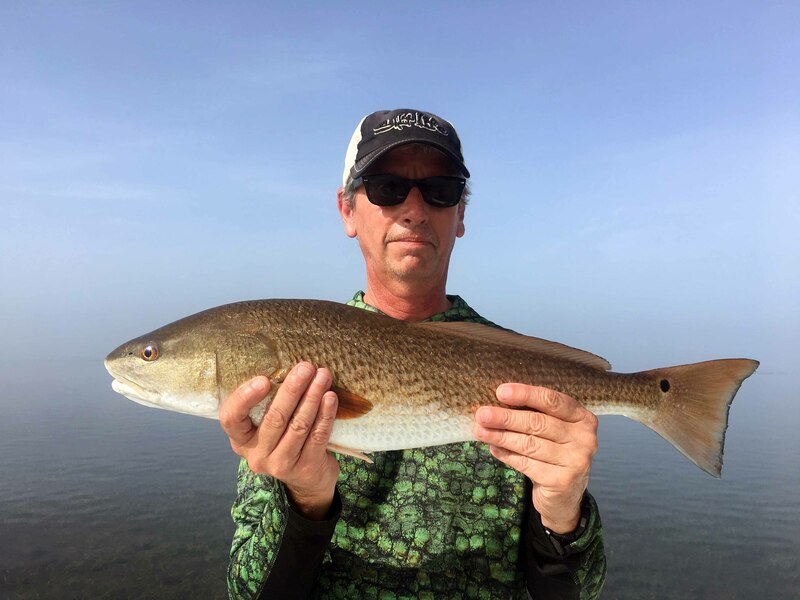 The several million recreational anglers in Gulf states get to harvest the rest, 2/person/day for 3 days. Your allowable catch is 6 fish. It is difficult find a rational defense for this mismanagement of a public resource. It is certainly not the highest and best use. 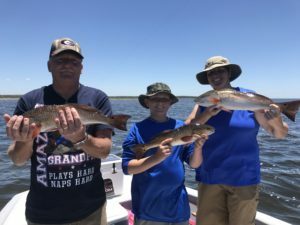 The economic value of recreational fishing is an order of magnitude beyond that of the commercial industry. The good news is red snapper have rebounded from a combination of a couple of years juvenile classes having escaped being shoveled dead over the side of shrimp boats as bycatch after the hurricanes of last decade…and finfish excluder devices seem to be allowing more juveniles to remain in the fishery to maturity and reach spawning age. The happy result is legal size red snapper absolutely swarm over shallow water reef structures out to middle grounds and beyond. 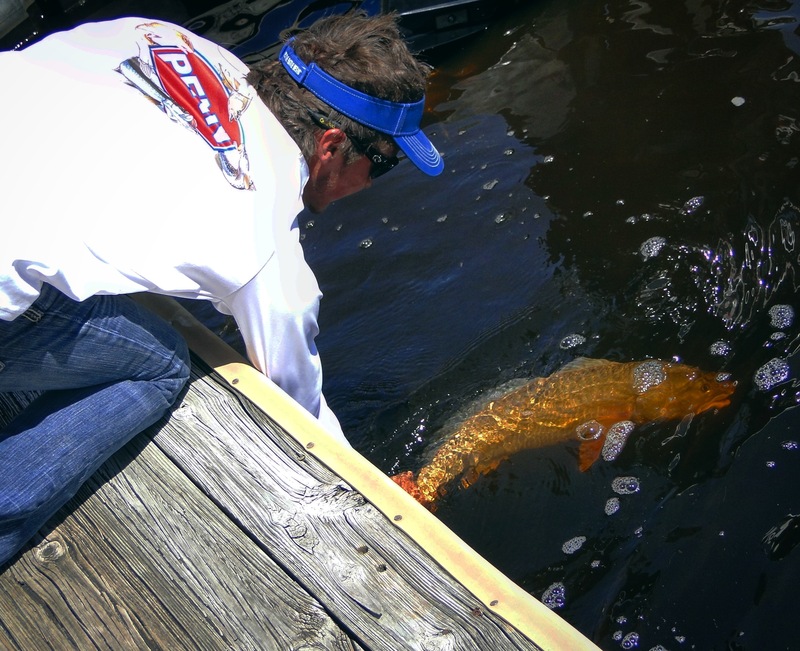 Snapper aggressively take cut bait when gags become more finicky as the water warms for summer. Live bait can be successful for gags when cut bait no longer entices a bite. 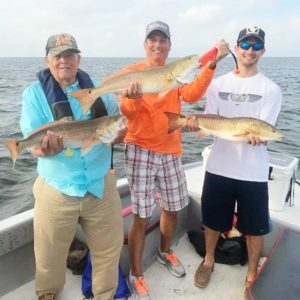 Big kings and cobia are on the prowl around wrecks and bottom structure. Warm weather and calm seas make for the most enjoyable days on the water, take advantage of it. 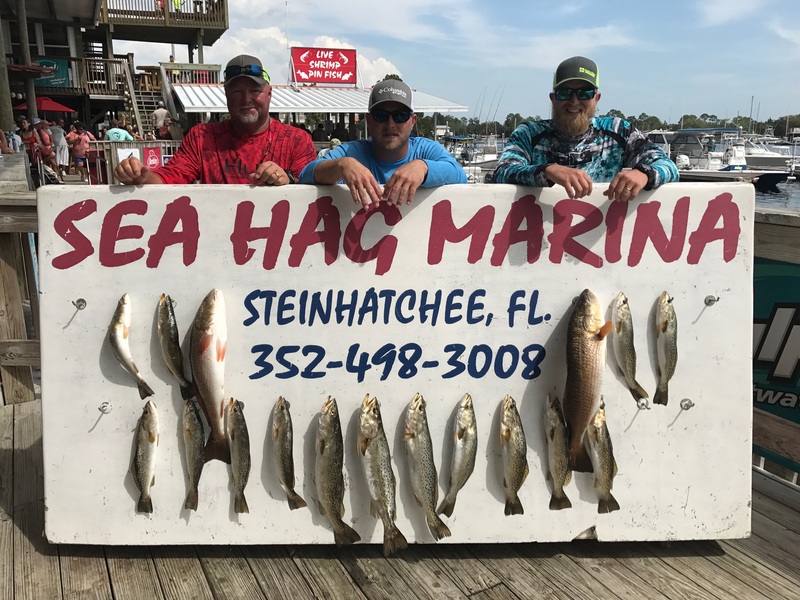 Sea Hag Marina is the capital of red snapper fishing for the Big Bend. 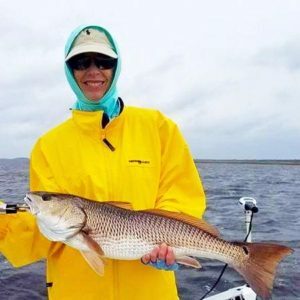 Tight lines, and I hope to see you on the water.